Whenever AC power falls below 104 volts, or rises above 132 volts, the EMS automatically shuts down power to the RV. 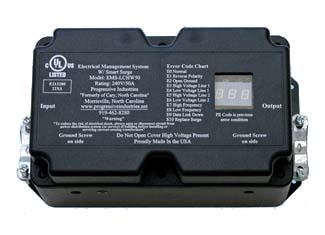 The EMS will monitor the power and once the AC power rises above 104 volts, or below the 132 volt level, the time delay indicator flashes for the preset time and then automatically restores power to the RV. If the AC power is interrupted, or the EMS detects a fault condition, the built-in time delay is activated. There are tow settings on the EMS: one is 136 seconds (02:16), and the other is 15 seconds. Consult your air conditioner manual to see if it has a time delay built in. If so, use the 15 second delay, if not; use the 136 second delay. The factory setting is 15 seconds. This feature provides full surge protection L-N, L-N, L-G, L-L and N-G. Total Joule rating is 3,580, 88,000A surge current. Response time of <1 nano second. In the event of a power surge, and the surge protector circuit is damaged within the EMS, L-N or L-G, the digital display error code will read E-10. This indicates the EMS needs to be serviced. If AC power is a reverse polarity condition, the EMS will not allow power to the RV and the error code will read E-1. If AC power has an open neutral condition, the display will not light, and the EMS will not allow power to the RV. If AC power has an open ground condition, the EMS will read an error code of E-2 and power will not be allowed to the RV. If AC power frequency deviates +/- 9 hertz from 60 cycles per second, the EMS will shut down power. An error code of E-7 will be displayed when the frequency is high; and an error code will be displayed when frequency is low. Continuously scrolls all of the AC power information, including voltage, current, frequency, error codes and previous errors. Each reading is displayed for two (2) seconds. This feature tells the user what the previous error was and why power was interrupted to the RV. To read a previous error code, put a "P" in front of the "E" code. This is only displayed if an actual error occurs. The error is deleted when power is disconnected from the EMS. This switch is located on the remote panel, and allows the user to bypass the computer circuit in the EMS in the event of computer failure, thus allowing AC power into the RV. This does not disable the surge protection portion of the EMS; however, all other features are disabled. Replacement parts are designed for simple plug and play, making repairs extremely user friendly. The computer is driven by a state-of-the-art microprocessor that is programmed with software to drive the entire EMS.